We’re just a handful of days into November, but there is always a playoff feel to the rink whenever North Dakota comes to town. Especially with both teams ranked and Miami off to a 7-3 start. The Fighting Hawks began the season 0-2-1 but have won four straight as they open their NCHC season. 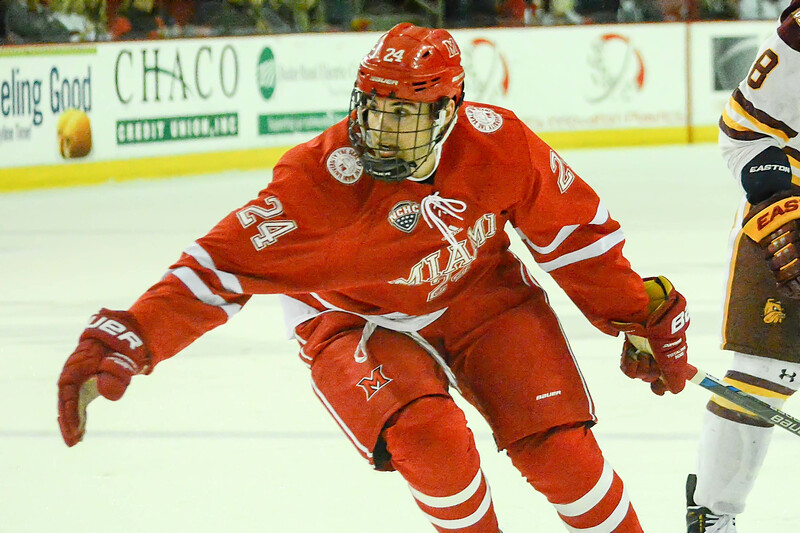 BoB takes a look at the series between NorDak and the RedHawks this weekend. WHO: No. 11 North Dakota Fighting Hawks (4-2-1) at No. 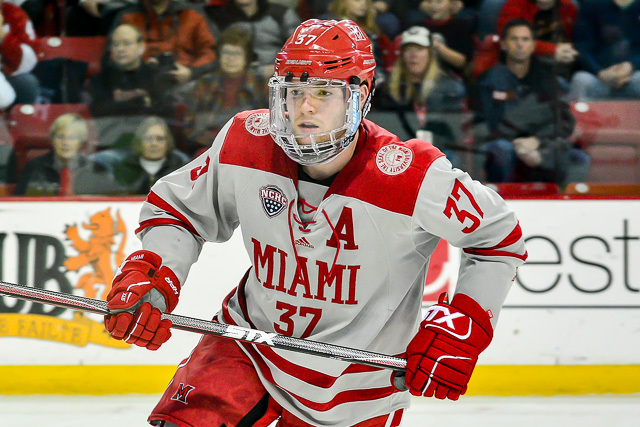 19 Miami RedHawks (7-3). WHERE: Cady Arena, Oxford, Ohio (3,642). ALL-TIME SERIES: North Dakota leads, 13-6-3. LAST SEASON HEAD-TO-HEAD: Teams both finished 1-1-2. Nov. 10 – North Dakota, 4-1; Nov. 11 – Tie, 3-3; Feb. 23 – Miami, 4-3, OT; Feb. 24 – Tie, 2-2. NORTH DAKOTA RADIO: Both nights – KQHT-FM (96.1), Grand Forks, N.D.
NOTES: North Dakota was winless through three games, going 0-1-1 in a home-and-home vs. Bemidji State and losing, 7-4 at home to Minnesota State. But the rejuvenated Fighting Hawks have won their last four, all against ranked non-conference opponents. Up front, Nick Jones leads UND in points with six, five of which have come on assists. He has scored three goals in five career games vs. Miami. Jordan Kawaguchi is second among forwards with five points, all on helpers. Grant Mismash and Rhett Gardner are both 3-1-4, and Gardner has scored four goals and added two assists against the RedHawks. Forwards Cole Smith and Collin Adams also have four points. On defense, Colton Poolman is tied for the team lead with three goals, also earning two assists. UND has had heavy production from its blue line, as Gabe Bast and Jacob Bernard-Docker are both 2-2-4, Hayden Shaw has four assists and Matt Kiersted has a goal and two helpers. Peter Thome had a strong 12-game showing in net as a rookie last season, but after a poor game early freshman Adam Scheel has gone 4-1-1 with a 1.58 goals-against average and a .923 save percentage. Scheel has keyed the Fighting Sioux’s four-game winning streak, so barring sub-par performance he should play both nights. UND is third in the NCAA in faceoff percentage at 59.0, with Gardner leading college hockey at 66.2 percent. This has been a Miami weakness in recent seasons but the RedHawks are tied for 16th in Division I this season with a winning percentage of 53.8. North Dakota leads the conference in NHL draftees with eight. Special teams have been a struggled for the Fighting Hawks, who are 47th in the NCAA in power play percentage (14.3) and tied for 12th-last at 75.0 on the penalty kill. 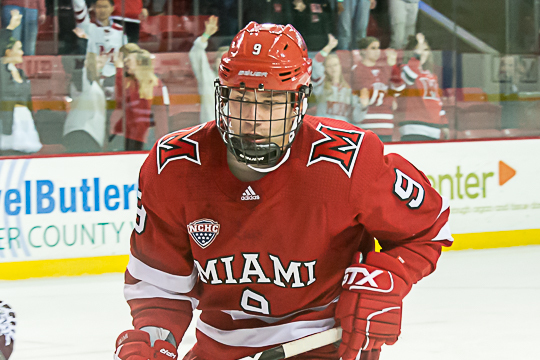 Miami’s Gordie Green enters this weekend having scored in four straight games with five tallies in that span. His points streak is at five games, and he has 10 points during that streak. 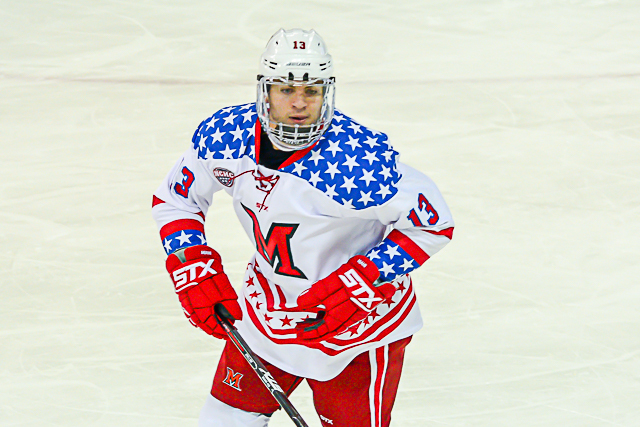 The RedHawks went four straight games without a power play goal earlier this season but have netted at least one marker on the man advantage in five consecutive contests. 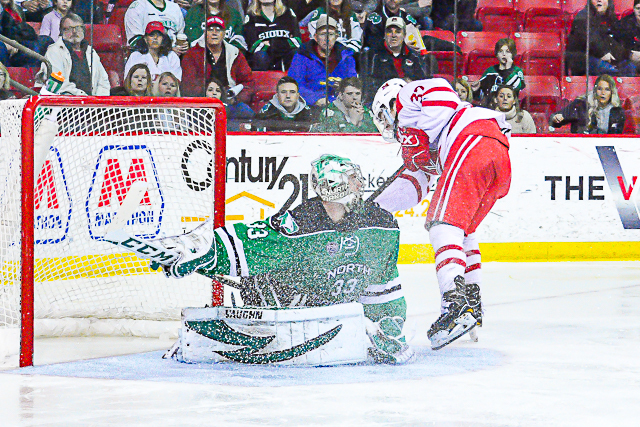 Miami is 1-1 in the NCHC, and these will be the first conference contests for North Dakota. WHO: UMass-Lowell Riverhawks (1-1) at Miami RedHawks (3-1). ALL-TIME SERIES: UMass-Lowell leads, 1-0-1. 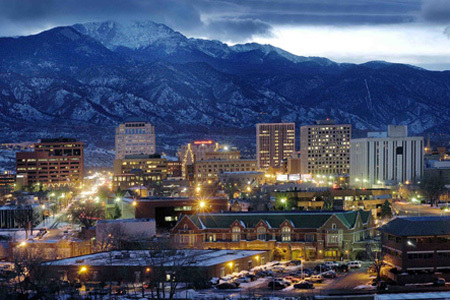 UMASS-LOWELL RADIO: Both nights – WCAP-AM (980), Lowell, Mass. NOTES: Funny that this will be the first-ever meeting between these teams on one of their campuses. They’ve met twice: Once in the Frontier Classic in Anchorage in the fall of 2003, a game that ended tied, 4-4, and again in the first round of the 2012 NCAA Tournament. The latter was a skate-to-the-throat 4-3 overtime loss that saw the RedHawks rally from three down to tie it only to surrender a goal in the extra session. So in two all-time meetings, both games have gone past 60 minutes. Miami might welcome a close contest, as each of its four games this season have been decided by three or four goals. The RedHawks are coming off a third-place finish in the four-team Ice Breaker in Erie, Pa., that saw them drop a 4-0 decision to No. 5 Providence but handle host Mercyhurst, 3-0 in the consolation game. The week before Miami swept an unimpressive Alabama-Huntsville team, outscoring the Chargers, 9-1. The Riverhawks split their season-opening series vs. RIT, with both of those games decided by a goal. They won the opener, 2-1 but lost 4-3 in the finale. Senior forwards Ryan Dmowski and Connor Wilson both went 1-2-3 the opening weekend and lead the team in points. Dmowski went 11-11-22 in 2017-18, leading the team in goals. Kenny Hausinger scored twice vs. RIT. He scored 10 goals and set up 10 more last season. Tampa Bay selection Ryan Lohin is the returning team leader in assists (16) and points (25), and freshmen Sam Knoblauch and Reid Stefanson have both scored in the team’s first two games. Mass.-Lowell had three defensemen total at least 17 points last season but all were seniors. Croix Evingson and freshman Seth Barton have dished for two assists each, and Mattias Goransson has one helper. Evingson was drafted by Winnipeg and Barton was taken by Detroit. In net, Christoffer Hernberg was a stud last year with a 2.07 goals-against average and .921 save percentage. Ty Wall struggled in 12 games as his backup. But last weekend Wall – a New York Rangers draftee – was 25-for-26 in a win while Hernberg suffered the loss, allowing five goals on 30 shots. For the first time since 2001-02, North Dakota failed to qualify for the NCAA Tournament. Coach Brad Berry won the national championship in his first season with the Fighting Hawks in 2015-2016, but the team won just 21 games the following campaign – its worst total in 15 years – and posted just 17 victories last season. Four NHL draftees join the Fighting Hawks, who enter 2018-19 trying not to become the first UND squad since 1996 to miss to national championship tournament back-to-back years. NCAA titles: 8 (1959, 1963, 1980, 1982, 1987, 1997, 2000, 2016). COACH: Brad Berry (4th season, 72-35-17, .649 winning percentage). 2017-18 RECORDS: 17-13-10 (8-10-6 in NCHC). POSTSEASON: Lost to St. Cloud State in an NCHC Tournament semifinal. RINK (capacity): Ralph Engelstad Arena (11,634). MIAMI VS. NORTH DAKOTA LAST SEASON: 1-1-2. 2018-19 SCHEDULE VS. MIAMI: Nov. 9-10 – at Miami. KEY RETURNING PLAYERS: G Peter Thome, D Colton Poolman, F Grant Mismash, F Rhett Gardner, F Nick Jones. KEY NEW FACES: F Gavin Hain, F Jasper Weathersby, F/D Jonny Tychonick, D Jacob Bernard-Docker, G Adam Scheel. KEY LOSSES: G Cam Johnson, D Christian Wolanin, F Shane Gersich, F Austin Poganski. NOTES: North Dakota averaged fewer than three goals per game for the first time in the NCHC era, as the Fighting Hawks ended the season fifth in the league in scoring, their lowest finish since the conference’s inception. And three of UND’s top three four goal producers from 2017-18 have joined the pro ranks. Fortunately for the Fighting Hawks, leading sniper Nick Jones is back after the Ohio State transfer led the team with 15 markers and ranked second on the team in points with 30. Nashville second-round pick Grant Mismash returns after posting nine goals and 13 assists as a freshman, and he is expected to take a major step up this season. North Dakota’s other returning 20 point-producing forward is Rhett Gardner, who went 7-13-20. Three other Fighting Hawks reached double figures in points – Jordan Kawaguchi, Joel Janatuinen and Cole Smith. Islanders draft pick Collin Adams was limited to 26 games in 2017-18 but scored five goals and could make a significant leap. NHL draftee forwards USNDT product Gavin Hain and 6-feet-3 Jasper Weathersby enter their freshman seasons. On defense, captain Colton Poolman scored seven times and picked up 22 assists last season while being whistled for just four penalties. UND’s blueline is deep – five other defenseman logged at least 25 games last season. Hayden Shaw dressed for all 40, going 3-10-13 and Gabe Bast tallied 10 assists in just 27 games. Matt Kiersted, Casey Johnson and Andrew Peski all played in the majority of the Fighting Hawks’ contests. And North Dakota added the Ottawa Senators’ first- and second-round picks from 2018 in Jacob Bernard-Docker and Jonny Tychonick. The Alberta-raised tandem has played together since age 10. Columbus draft pick Peter Thome posted a 2.14 goals-against average and .910 save percentage – showing how strong UND’s defense was last season – and he remains the favorite to start the majority of games this season after playing in 29 as a freshman. Freshman Adam Scheel should be Thome’s primary backup after a strong showing in the BCHL in 2017-18. North Dakota set a program record with 10 ties last season, which is part of the reason the team struggled to reach 20 wins. Eleven more of its contests were decided by one goal. Despite the Fighting Hawks’ downturn the past two seasons, in May coach Brad Berry signed a five-year deal that will run through 2022-23. NOTE: BoB is previewing each NCHC team leading into the 2018-19 season. This is the fifth of seven installments. Last season, Mike Gabinet inherited a team that had gone .500 the previous season and a game over that mark in 2015-16. Despite the coaching change, Nebraska-Omaha proved itself the master of consistent mediocrity, finishing 17-17-2 in 2017-18. It’s been a tough follow-up to the Mavericks’ first-ever NCAA semifinal round berth in 2015, as none of their subsequent seasons have produced return trips onto college hockey’s highest stage. 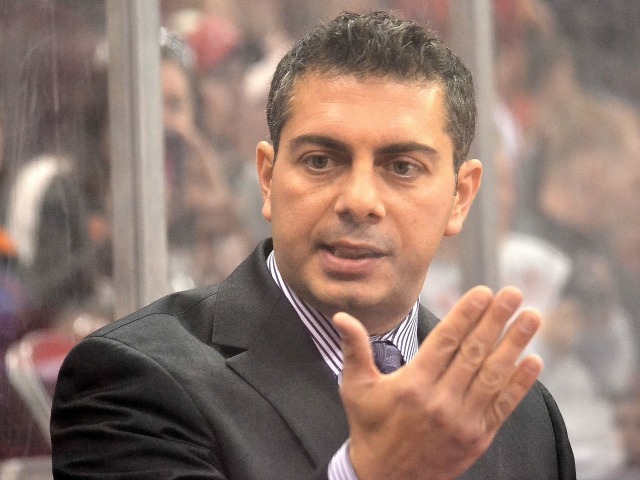 The loss of assistant coach Peter Mannino to in-conference rival Miami, as well as the resulting departure of multiple recruits to the RedHawks this off-season will not make it any easier for UNO to qualify for the NCAAs in 2018-19. 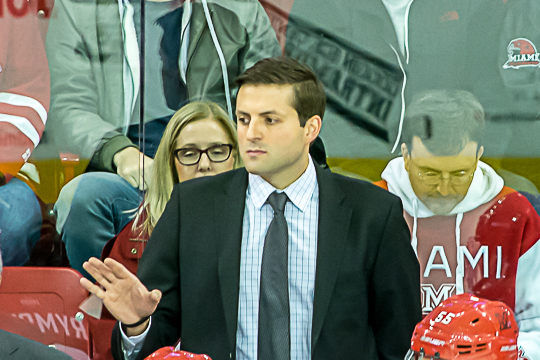 COACH: Mike Gabinet (17-17-2 in 1 season). 2017-18 RECORDS: 17-17-2 overall, 10-13-1 in the NCHC (6th place). POSTSEASON: Lost to North Dakota in NCHC semifinal round. RINK (capacity): Baxter Arena (7,898). MIAMI VS. UNO LAST SEASON: 0-2. 2018-19 SCHEDULE VS. MIAMI: Nov. 2-3 – at UNO; Feb. 8-9 – at Miami. TOP RETURNING PLAYERS: G Evan Weninger, F Zach Jordan, F Tristan Keck, F Steven Spinner, F Fredrik Olofsson, D Ryan Jones. KEY LOSSES: F David Pope, F Tyler Vesel, F Jake Randolph, D Joel Messner. KEY NEW FACES: F Tyler Weiss, F Chayse Primeau, F Taylor Ward, D John Schuldt. NOTES: In addition to losing Mannino and two top-tier recruits, Nebraska-Omaha graduated four of its top five points producers from 2017-18. Forward Zach Jordan is the team’s top returning points producer, as he posted 28 points including 16 goals last season. Also up front, Tristan Keck, Fredrik Olofsson and Steven Spinner reached the 20-point mark in 2017-18. Teemu Pulkinen netted eight goals and Mason Morelli dished for 10 assists. The Mavericks expect 150-pounder Tyler Weiss to contribute immediately, as he is a USNDT product and Colorado Avalanche draftee. Same goes for 6-feet-3 Chayse Primeau, whose father Keith played in the NHL. No returning UNO defenseman tallied more than two goals last season, and Ryan Jones is the Mavericks’ top returning points-getting among blueliners with 13. D-man Lukas Buchta, Jalen Schulz and Dean Stewart are also back after turning in solid seasons for UNO in 2017-18. 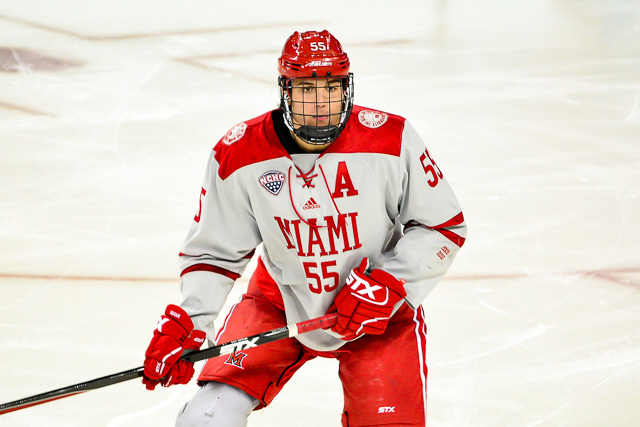 Freshmen John Schuldt and Jason Smallidge look to make an immediate impact on the Mavericks’ blueline, but key defense commit Derek Dashcke bolted for Miami. Goalie Evan Weninger is back after logging over 80 percent of UNO’s minutes between the pipes. His numbers weren’t great – his save percentage was .899 and goals-against 3.35 – and Philadelphia Flyers draftee and North Dakota transfer Matej Tomek could eat into Weninger’s ice time. UNO needs serious improvement on the back end – the team was dead last in Division I in goals against per game and 49th on the penalty kill in 2017-18. Conversely, the Mavericks finished seventh in goal average and were seventh on the power play. 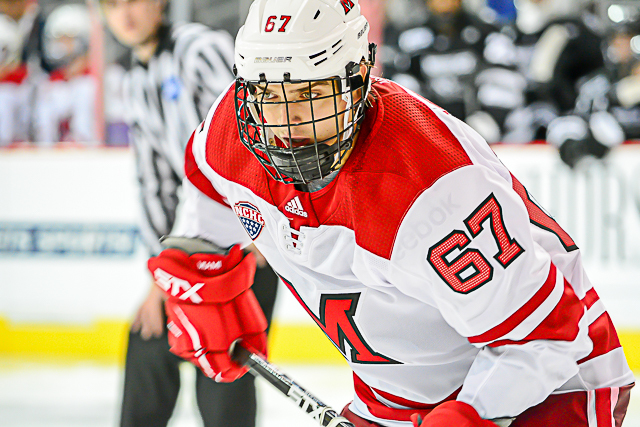 Nebraska-Omaha’s tendency toward high-scoring affairs was exemplified by its series sweep vs. the RedHawks in Omaha that saw 25 goals including an 11-7 weekend opener. That set extended UNO’s unbeaten streak vs. Miami to six games, as the Mavericks are 5-0-1 against the RedHawks the past two seasons. NOTE: BoB is previewing each NCHC team leading into the 2018-19 season. This is the fourth of seven installments.